Watch clips of the G.O.O.D. Music showcase. summer jam now. we're doing PABLO at 2 am in Manhattan. sorting out where now. 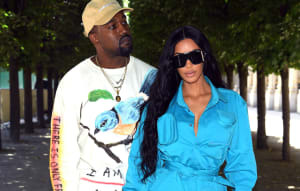 After his performance at Sunday's Governor's Ball was cancelled, Kanye West crossed the river to New Jersey and showed up as a surprise guest at Hot 97 Summer Jam. According to a set list posted before the show by Virgil Abloh, the surprise set is a bit of a G.O.O.D. Music showcase. Abloh also teased a 2 a.m. secret show from Kanye without listing a location in a since edited caption, which ended up being the site of a large gathering of fans waiting for a show that never happened at Webster Hall. Reps for Kanye West were not immediately available for comment. This post was updated on June 6 with information about the Webster Hall show.